The Golden State Warriors are a professional basketball team based in Oakland , California . They are part of the Pacific Division of the Western Conference in the National Basketball Association (NBA). The team was first established in 1946 in Philadelphia , Pennsylvania , where the franchise won the championship in the inaugural season of the Basketball Association of America (BAA), the league that would eventually become the National Basketball Association. In 1962, the franchise was relocated to San Francisco , California and became known as the San Francisco Warriors until 1971, when its name was changed to the current Golden State Warriors. The team has played all of its home games in the Oracle Arena since 1966, with the exception of a one-year hiatus. Along with their inaugural championship win in the 1946–1947 season, the Warriors have won two others in the team's history, including another in Philadelphia after the 1955–56 season, and one as Golden State after the 1974–75 season, which is tied for 5th in the NBA in number of championships. The Warriors were founded in Philadelphia , Pennsylvania in 1946 as the Philadelphia Warriors, a charter member of the Basketball Association of America. They were owned by Peter Tyrrell, who also owned the Philadelphia Rockets of the American Hockey League. Tyrell hired Eddie Gottlieb, a longtime basketball promoter in the Philadelphia area, as coach and general manager. He named the team after an early professional team in the city. Led by early scoring sensation Joe Fulks, they won the championship in the league's inaugural 1946–47 season by defeating the Chicago Stags, four games to one. (The BAA became the National Basketball Association in 1949.) Gottlieb bought the team in 1951. The Warriors won their only other championship as a Philadelphia team in the 1955–56 season, defeating the Fort Wayne Pistons four games to one. The stars of this era in the team's history were future Hall of Famers Paul Arizin and Neil Johnston. In 1959, the team signed draft pick Wilt Chamberlain. Known as "Wilt the Stilt", Chamberlain quickly began shattering NBA scoring records and changed the style of play forever. On March 2, 1962, in a Warrior "home" game played on a neutral court in Hershey, Pennsylvania , Chamberlain scored 100 points against the New York Knicks, a single-game record that the NBA ranks among its finest moments. In 1962, Franklin Mieuli purchased the majority shares of the team and relocated the franchise to the San Francisco Bay Area , renaming them the San Francisco Warriors, playing most of their home games at the Cow Palace in Daly City (the facility lies just south of the San Francisco border), though occasionally playing home games in nearby cities such as Oakland and San Jose . The Warriors won the 1963–64 Western Division crown, losing the NBA championship series to the Boston Celtics, four games to one. In the 1964–65 season, the Warriors traded Wilt Chamberlain to the Philadelphia 76ers, as they only won 17 games that season. In 1965, the Warriors drafted Rick Barry in the first round. Barry was named NBA Rookie of the Year in his first season, then led the Warriors to the NBA finals in the 1966–67 season, where the team lost (four games to two) to the team that replaced the Warriors in Philadelphia, the 76ers. Angered by management's failure to pay him certain incentive awards he felt he was due, Barry sat out the 1967–68 season, joining the Oakland Oaks of the rival American Basketball Association the following year. After four seasons in the ABA, Barry rejoined the Warriors in 1972. With the opening of the Oakland Coliseum Arena in 1966, the Warriors began scheduling increasing numbers of home games at that venue. The 1970–71 season would be the team's last as the San Francisco Warriors. The Warriors changed their name to the Golden State Warriors for the 1971–72 season, playing almost all home games in Oakland. Six "home" games were played in San Diego during that season but more significantly, none were played in San Francisco or Daly City. After changing their name from the San Francisco Warriors, the Warriors became (and remain) the only NBA team that does not include the name of their state or their city in their name (although "Golden State" is a well-known California nickname). The Warriors made the playoffs from 1971 to 1977 (except 1974), and won their only championship on the West Coast in 1974–75. In what many consider the biggest upset in the history of the NBA, the Warriors defeated the heavily favored Washington Bullets in a four-game sweep. That team was coached by former Warrior Al Attles, and led on the court by Rick Barry, Jamaal Wilkes and Phil Smith. So little was felt of the team's chances in the playoffs, even by their home fans, that the Coliseum Arena scheduled other events during the dates of the NBA playoffs. As a result, the Warriors did not play their championship series playoff games in Oakland; rather, they played at the Cow Palace in Daly City. Because of the loss of key players such as Barry, Wilkes and Thurmond, to bad trades and retirements, the Warriors would struggle to put a competitive team on the court from 1978-1987 following their time as one of the NBA's dominant teams during the 1960s and throurgh most of the early and mid 1970s. They would, however, through the draft acquire such standout players such as high-scoring forward Purvis Short (1978), former Georgetown Hoyas point guard Eric "Sleepy" Floyd (1982) (who would later become an All-Star before being traded to the Houston Rockets), and former Purdue University standout center Joe Barry Carroll, (1980) whose once promising career would be short-circuited because of injury, as well as center Robert Parish (1976), whom they would trade to the Boston Celtics in 1980. The departure of these players for various reasons symbolized thefranchise's futility during this period, as head coach Al Attleswould move up into the front office to become the team's General Manager in 1980, and the team would go through several coaching changes. However, with Attles installed as GM, they would finally manage to climb back to respectability by hiring former Cleveland Cavaliers head coach George Karl as head coach in 1986. They would also find a diamond in the rough, of sorts, that would change the direction of the franchise, drafting St.John's University standout sharpshooting small forward Chris Mullin in the 1985 NBA Draft. After a subpar stretch in the late 1970s and early 1980s, the team had a brief resurgence with coach Karl, culminating in a famous 1987 Western Conference Semifinal match against Magic Johnson's Lakers, which is still shown on TV in the NBA's Greatest Games series. In the game, the Warrior's NBA All-Star point guard Sleepy Floyd had an amazing performance in the second half, which is still the NBA playoff record for points scored in a quarter (29) and in a half (39). Floyd scored 12 consecutive field goals in the fourth quarter, finishing the game with 51 points, and leading the Warriors to victory. The "Sleepy Floyd Game" was a catalyst for increased interest in the NBA in the Bay Area, which was furthered by new coach Don Nelson who engineered another successful string of wins in the late 1980s to early 1990s with the high scoring trio of point guard Tim Hardaway, guard Mitch Richmond, and forward Chris Mullin (collectively known as "Run-T.M.C." after the rap group Run-D.M.C.). However, coach Don Nelson wishing to get frontcourt players to complement his run-and-gun system, made a trade that broke up the Run-T.M.C. core by sending Richmond to the Sacramento Kings for Billy Owens while bypassing Dikembe Mutombo, who was selected next by the Denver Nuggets. Nelson was brought to the team by Jim Fitzgerald, who owned the team between 1986 and 1995. The following year, 1993–94, with first-round draft pick and Rookie of the Year Chris Webber playing alongside Latrell Sprewell, the Warriors made the playoffs. The season after that, however, saw a rift form between Webber, Sprewell and Nelson. All three soon left the team, and the organization went into a tailspin. 1994–95 was the first season under current team owner Chris Cohan. While the Oakland Coliseum underwent a complete renovation, the 1996–97 Golden State Warriors played their home games in the San Jose Arena in San Jose, California , struggling to a 30–52 finish. Sprewell was suspended for the remainder of the 1997–98 season for choking head coach P. J. Carlesimo during a team practice in December 1997. He would not play until he was dealt in January 1999 to the New York Knicks for John Starks, Chris Mills and Terry Cummings. Garry St. Jean became the new Warriors GM in July 1997; he and Dave Twardzik received much of the blame for the Warriors' struggles following the start of Chris Cohan's tenure, including Cohan himself. St. Jean brought in several players, such as Terry Cummings, John Starks, and Mookie Blaylock, who were well past their primes. Twardzik drafted several flops, such as Todd Fuller (while Kobe Bryant was still available) and Steve Logan (who never played an NBA game). In the following draft, the team selected Adonal Foyle while Tracy McGrady was still available. St. Jean did, however, draft the future 2-time NBA slam dunk champion Jason Richardson (from Michigan State ), who would become a key player on the team until the end of the 2006–07 season. For a few years, with rising stars Jason Richardson, Antawn Jamison and guard Gilbert Arenas leading the team, the Warriors seemed like a team on the rise. In the end the young Warriors just did not have enough in the ultra-competitive Western Conference. After the 2002–03 season, Garry St. Jean's earlier mistakes of committing money to players like Danny Fortson, Adonal Foyle and Erick Dampier were painfully felt by Warriors fans when the team was unable to re-sign up-and-coming star Gilbert Arenas, despite Arenas's desire to stay in the Bay Area. After spending two years in the Warriors front office as a special assistant, Chris Mullin succeeded Garry St. Jean and assumed the title of Executive Vice President of Basketball Operations. Among his first moves were the hiring of three former teammates to help run the organization: Mitch Richmond (special assistant), Mario Elie (assistant coach) and Rod Higgins (General Manager). Mullin hoped to build the team around Jason Richardson, Mike Dunleavy, Jr., and Troy Murphy—complementing them with experience in Derek Fisher, a free agent signed by Golden State after playing a key role on three championship Lakers squads, Calbert Cheaney, a playoff-tested sharpshooter and Adonal Foyle, an excellent shot-blocker who is perhaps better known for his off-court work as founder of the campaign finance reform organization, Democracy Matters. The team also drafted 7-foot center Andris Biedriņš from Latvia (11th overall). At the 2005 trading deadline, Mullin further added to the team by acquiring guard Baron Davis, bringing the team its first "superstar" since Mullin himself. Warriors fans hoped that 2005–06 would finally be the season that the team ended their playoff drought. Despite the poor play of newly re-signed Mike Dunleavy, Jr. and the broken hand of first round draft pick Ike Diogu, the Warriors enjoyed a great start to the 2005–06 season. They entered the new year with a winning percentage for the first time since 1994, but lost their first five games of 2006 and managed to win only 13 more games through the end of March. Star Baron Davis often found himself at odds with coach Mike Montgomery. Furthermore, Davis failed to remain healthy and played in just 54 games. He suffered a sprained right ankle in mid-February and did not return for long before being listed as an inactive player the remainder of the season. The injury-prone Davis had not played a full season since the 2001–02 campaign until the 07–08 season in which he played all 82 games averaging 21.8 points a game (incidentally a contract year). On April 5, 2006, the Warriors were officially eliminated from playoff contention with a 114–109 overtime loss to the Hornets, extending their playoff drought to 12 seasons. During the offseason, the Warriors rebuilt themselves. First in the 2006 NBA Draft, the Warriors selected center Patrick O'Bryant with the 9th overall selection. They also traded Derek Fisher to the Utah Jazz for guards Devin Brown, Andre Owens and Keith McLeod, and signed training-camp invitees Matt Barnes, Anthony Roberson and Dajuan Wagner. Brown, Owens, Wagner, Roberson, Chris Taft and Will Bynum were all waived while Barnes established himself in the rotation. Golden State also announced that it had bought out the remaining two years of head coach Mike Montgomery's contract and hired previous Golden State and former Dallas Mavericks coach Don Nelson to take over in his place. Entering the 2006–07 season, the Warriors held the active record (12) for the most consecutive seasons without a playoff appearance (see Active NBA non-playoff appearance streaks). The 2006–07 season brought new hope to the Warriors and the Warriors faithful. Fans hoped that the Warriors will eventually find themselves among the NBA's elite with Don Nelson leading a healthy Baron Davis, an ever-improving Jason Richardson, and future stars Monta Ellis and Andris Biedriņš. On January 17, 2007, Golden State traded Troy Murphy, Mike Dunleavy, Jr., Ike Diogu, and Keith McLeod to the Indiana Pacers for forward Al Harrington, forward/guard Stephen Jackson, guard Šarūnas Jasikevičius, and forward Josh Powell. Many Warriors fans praised GM Chris Mullin for the trade for getting rid of considerable financial burdens in Dunleavy and Murphy. The Warriors now sought to "run and gun" their way to the playoffs with a more athletic and talented team. On January 24, the Warriors won their first game with their revamped roster, with encouraging play from Monta Ellis, Al Harrington, and Baron Davis against the New Jersey Nets, ending dramatically on a buzzer beater from Ellis. March 4, 2007 marked the turning point in the Warriors season. They suffered a 107–106 loss in Washington handing them their 6th straight loss when Gilbert Arenas hit a technical free throw with less than one second remaining. The loss dropped them to 26–35, a hole inspiring the squad to a point of total determination. On April 18, 2007, the Warriors clinched their first playoff bid since 1994 with a resounding 120–98 victory in their season finale at Portland. The Warriors closed out the regular season (42–40) with a 16–5 ending run.During the run, they beat Eastern top seed Detroit Pistons 111–93, snapping their 6-game losing streak and notching their first win on the tail end of a back-to-back. The Warriors also ended the Dallas Mavericks' 17-game win streak with five players recording double digits. "We Believe" became the Warriors' slogan for the last couple months of the season and the playoffs. On April 22, 2007, the Warriors played their first playoff game in 13 years, and beat the Dallas Mavericks 97–85, holding MVP Dirk Nowitzki to just 4-of-16 shooting, making it 6 straight against the NBA-best, 67 game winners. But the Warriors were crushed by the Mavericks in Game 2 when both Baron Davis, sometimes referred to as "Boom Dizzle" by fans, and Stephen Jackson, also known as Captain Jack, were ejected from the game. Then the Warriors bounced back by winning both Games 3 and 4 at home, putting Dallas on the brink of elimination. A close Game 5 saw the Mavericks eke out a 118–112 victory to send the 3–2 series back to California. The Warriors led by 9 with 2:41 left in the game, but Dallas scored 15 straight points. On May 3, 2007, the Warriors, with the help of their explosive third quarter, eliminated the Mavericks and became the first #8 seed to beat a #1 seed in a seven-game series. This was the Warriors' first playoff series win in 16 years. The Warriors went on to play the Utah Jazz in the second round of the 2006–07 playoffs. Facing the Utah Jazz in the Conference Semifinals, The Warriors dropped two close games at EnergySolutions Arena to open the series. The Warriors had the chance to win both games late. In Game 1, Stephen Jackson missed a wide open 3 pointer that would have put the Warriors ahead with 6 seconds left. In Game 2, the Warriors led by 3 with 15 seconds left, but missed free throws allowed the Jazz to tie the game and eventually win in overtime. The series then shifted to the Oracle Arena , where the Warriors won Game 3 in a convincing blowout. Baron Davis scored 32 points and electrified the crowd with a monster dunk on Jazz forward Andrei Kirilenko late in the fourth quarter, the Warriors won the game 125–105 to avoid going 0–3 in the series. The Warriors went on to lose Game 4 at home, in what was their first loss in Oakland in well over a month. The Jazz closed out the Warriors in Game 5 in Salt Lake City . In the end, the physical play of the Jazz simply wore down the smaller Warriors. After reestablishing itself as a playoff contender in the past season, the team set high expectations for itself. A much challenging year was foreseeable because the "We Believe" generation of Warriors had already gotten attention of the whole league. Shooting guard Jason Richardson was also traded to the Charlotte Bobcats for rookie Brandan Wright. To make things harder, Stephen Jackson received a 7-game suspension for his firearm incident. The absence of Jackson hurt the Warriors, as the team opened the season with six straight losses. Things immediately turned around with Jackson's return. The Warriors quickly fought back into playoff position. Monta Ellis' rise, Baron Davis' solid injury-free season (21.6 points, 8 assists, 4.6 rebounds per game), and an overall improvement in chemistry, led to the good play of the team after the Jackson's return. It was the first time the Warriors had three players average 20 points per game since the T-M-C era (Davis at 21.7, Ellis at 20.7, Jackson at 20.1). On January 29, 2008, the Warriors signed Chris Webber for the rest of the season. But the Warriors offense was too fast for Webber and he ended up playing only nine games, averaging 3.9 points and 3.6 rebounds in 14 minutes per game before been waived on March 25, 2008. Webber announced that he is officially retired from basketball due to persistent problems with his surgically repaired knee. On April 14, 2008, the Warriors were officially eliminated from the 2008 Western Conference Playoffs, despite having a 48–34 season, after losing to the Phoenix Suns 122–116 in Phoenix. 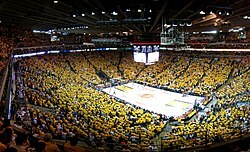 The Warriors sold out nearly every home game during the season averaging 19,631 per game, the highest in team history. On June 30, 2008, Baron Davis opted out of the last year of his contract with Golden State. Days before July 9, when teams were officially allowed to sign free agents, he had verbally agreed to a five year, $65 million deal with the Los Angeles Clippers. To replace Davis, Golden State offered Gilbert Arenas and Elton Brand lucrative contracts, but Arenas re-signed with the Washington Wizards and Elton Brand signed with the Philadelphia 76ers. With the 14th pick of the 2008 NBA draft, the Warriors selected and signed Anthony Randolph out of LSU. On July 10, Golden State inked Clipper free agent Corey Maggette to a five year, $50 million deal. On July 19, 2008, the Warriors signed Ronny Turiaf from the Los Angeles Lakers. Also, on July 22, 2008, the Warriors acquired Marcus Williams from the New Jersey Nets for a future first-round draft pick. On July 24, 2008, the Warriors resigned Monta Ellis to a new 6-year contract worth $66 million, matched the Clippers' July 17, three year, $9 million offer for Kelenna Azubuike, and signed second round draft pick Richard Hendrix. On July 26, 2008, the Warriors also resigned Andris Biedrins with a six-year contract worth nearly $63 million (including bonuses). On November 21, 2008, the Warriors traded forward Al Harrington to the New York Knicks for guard Jamal Crawford. On January 23, 2009, after missing 43 games due to injury and suspension, Monta Ellis returned in a loss to the Cleveland Cavaliers. He recorded 20 points, three rebounds, three assists, one steal and one block. On April 14, 2009, fans cheered as rookie Anthony Randolph scored 24 points with 16 boards to lead the Warriors to a 30 point loss against the San Antonio Spurs. As the youngest team in the NBA, the Warriors were ranked second in the league in scoring averaging 108.6 points per game. The Warriors had a disappointing 2008–2009 season, finishing 29–53. Their record can be largely attributed to the absence of Monta Ellis in the beginning of the season, injuries and the minimal experience of the young players such as CJ Watson, Rob Kurz, Anthony Morrow and Brandon Wright. Warriors' head coach Don Nelson often had to make adjustments to the starting lineups since many of the original starters missed games due to injuries. Nelson used various starting lineups during the season and it was difficult to predict who would start each game. Nelson stated at the beginning of the year that the 08–09 season would be difficult, but saw tremendous growth among his young players, especially in rookie Anthony Randolph (14th pick in 2008 NBA draft from LSU). Randolph proved to be a consistent scoring threat, a strong defensive weapon and a promising player in the future. Lamar Odom, whom Randolph has often been compared to during the season, was even impressed with Randolph's ability and complimented his performances. Despite the team's losing record, the Warriors demonstrated that they can be a tough opponent with a healthy lineup and a strong bench. The Warriors showed that with leadership and improvement in their young players, they are able to defeat powerhouse teams such as their 99–89 win over the Boston Celtics. With the full recovery of the Warriors' starters and continued growth of the young rookies, the Warriors hope to be a playoff contender during the 2009–2010 season. On May 12, 2009, the Golden State Warriors decided not to renew the contract of General Manager Chris Mullin. Larry Riley took over as General Manager and drafted Stephen Curry with the 7th lottery pick. On June 25, 2009, Jamal Crawford was traded to the Atlanta Hawks for Acie Law and Speedy Claxton. On July 29, 2009, Marco Belinelli was traded to the Toronto Raptors for Devean George. On August 31, 2009, the Golden State Warriors signed forward/center Mikki Moore. On November 16, 2009, Stephen Jackson and Acie Law were traded to the Charlotte Bobcats for Raja Bell and Vladimir Radmanovic. Bob Fitzgerald does play-by-play and Jim Barnett does color commentary on Comcast SportsNet Bay Area. Together, they do over 70 Warriors games a year on CSN. They also host "Roundtable Live", a half-hour pre-game show leading up to the broadcast of select Warriors home games. Bob is in his 11th season broadcasting Warriors games while Jim is in his 23rd season. Matt Steinmetz and Scott Reese are the 3rd and 4th members of the broadcast team and do halftime and post-game analysis, while Jaymee Sire acts as the Warriors insider and sideline reporter. Tim Roye, who is in his 13th season doing Warrior games, does the play-by-play by himself without a color commentator. Exceptions are when the game is on national television, in which case, Jim Barnett (not doing TV) does color commentary. The games are broadcasted on KNBR -AM. Games at night, 7:30 Pacific Time, are broadcast on 680, while early starts on the East Coast are broadcast on 1050 to avoid interrupting The Razor and Mr. T. After each game, Tim Roye, Bob Fitzgerald, and Jim Barnett discuss the just-finished game and then they preview the upcoming games. Damon Bruce does the pre-game and post-game shows live from Oracle Arena . Major sponsors of the Warriors radio broadcast are Bud Light, Lucky's, and Corona Light. The team currently trains at Oakland Convention Center, Oakland , CA . Arizin, Fulks, Gola, Johnston and Phillip played all or most of their tenure with the Warriors in Philadelphia. Chamberlain's tenure was about evenly divided between Philadelphia and San Francisco. Lucas and Parish were elected mainly for their performances with other teams. Thurmond and Barry are the only Hall-of-Famers who spent significant time with the team since the 1971 move to Oakland and the name change to "Golden State." Meschery, Attles, Barry and Thurmond are also members of the Bay Area Sports Hall of Fame. Warriors' Webber calls it quits, SI.com. Retrieved on March 25, 2008. – Player profile, statistics, biography, and wallpapers.